I'm deviating from my usual focus on capital markets here to share some early thoughts on what I believe to be the future of the automobile industry. Recently, after a decade of not owning an automobile, I purchased a car. The car comes with an in-dash entertainment/navigation system that would have likely blown my mind ten years ago but today, despite it being an award-winning top-of-the-line system, it feels nothing short of antiquated. I find myself constantly thinking, “My phone would be better at this.” The problem, in my opinion, is the mismatch between mechanical and computing life cycles. The median age of the American automobile fleet is 11.2 years according to consulting firm Polk. In a computing time-table, 11 years is an eternity. To put it in context, the first generation iPhone was released only 5 years ago, in June 2007. In that short span of time we’ve seen cellular data technology transition from GPRS/G2 to 3G to 4G to 4G LTE which represents an increase from ~150kbps effective speeds for non-EDGE 2G to 11-16mbps on the newer 4G LTE networks. In the last 4 years alone, mobile phone bandwidth has increased by a factor of 6 and screen resolution has doubled and we’ve seen the introduction of what is probably the most advanced voice-recognition technology available to the mobile consumer. How is this relevant? Except for functions that are unlikely to change much in coming years like speakerphone capabilities or digital audio playback, the technologies at the center of modern in-car computers like data connectivity, A-GPS-aided navigation and voice recognition are evolving more rapidly than the replacement cycle of automobiles, leading to cars which have useful lives multiple times longer than the technology at the center of the user interface. Which brings us to the question; does the automobile really need an embedded computer? As smart-phones become ubiquitous and the computing power available in them grows exponentially, it makes sense to allow our smartphones to become our on-board entertainment and navigation systems. Just like the embedded car-phone gave way to Bluetooth hands-free technology and trunk-loaded CD changers were replaced by mini jacks and Bluetooth audio, so will data connectivity and navigation / entertainment systems. It simply makes no sense to embed wireless connectivity circuitry that will be woefully out-of-date in 3 years to a machine expected to last 15 years or more. It artificially severely limits the useful life span of an automobile and non-luxury producers will soon adapt as they see the opportunity to reduce costs while touting it as an advantage for the type of consumer that can’t afford to replace a car every 3 or 4 years. Once products like Ubuntu EDGE become a reality, there will be no need for auto manufacturers to include on-board entertainment computers anymore. Cars will feature a “dock” (wired initially, but eventually transitioning to wireless and featuring inductive-charging) and the necessary peripherals (microphone, displays, speakers, physical controls, if any). Your handset already has your music, your phone book, your address book, voice recognition, data-connectivity and A-GPS capabilities. Most importantly, your handset can (and does for many of us) back-up wirelessly and constantly to the cloud, ensuring that replacing our smartphone is as easy as buying and activating a new device and ensuring the possibility of massive data loss is minimal and the pain of transferring information to a new car (for example, a rental) is painless. If you follow me on twitter, you've seen this and can probably skip it. In what seems like a yearly event now, with 3 consecutive years of this game, tax-exempt municipal bonds are once again cheap. It could be the overall bond sell-off, it could be the Detroit scandal, it could be bond fund outflows; I don't know what the cause is, but I do know the bonds are cheap. 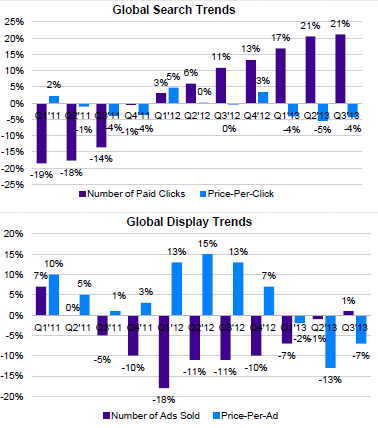 Frequent readers know we are generally fans of quantitative methods, so expect some numbers. The market underwent a structural change by which the old measures became invalid. An example of a similar event would be the '87 crash after which options began exhibiting (steeper) volatility smiles. In this case we would consider the structural change to be either a transition from rate-based to an credit-based market, a change in the way liquidity is priced post-GFC or a combination of the two. 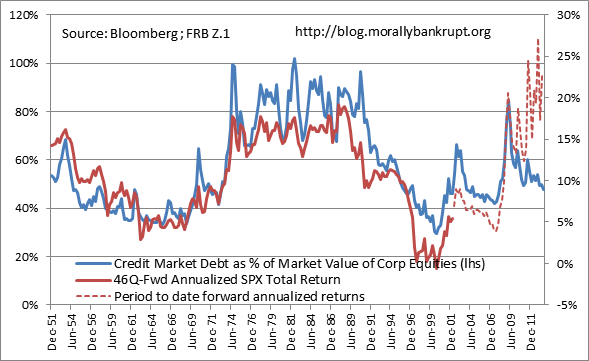 That the "fair-value" ratio is itself a function of interest rates and tax-exempt bonds exhibit negative convexity as yields approach a floor, a relationship which had not been visible until the introduction of ZIRP brought treasury yields down far enough for the relationship top be visible. 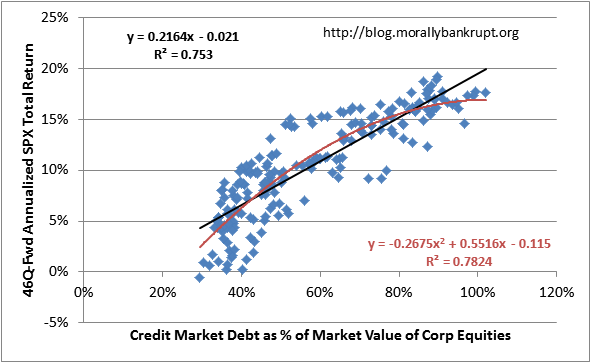 Although we agree with the assertions that, market-wide, the tax-exempt market has transitioned from rate to credit, we believe the AAA benchmark is exempt from this because of its information insensitive nature (for more on this see Slapped in the Face by the Invisible Hand by Gary Gorton) and while we generally agree about the repricing of liquidity post-GFC, we believe we have the ability to control for that (more later). A review of the data from 2001 to present day as well as our expectation of behavior by participants makes us believe the second option, that the "fair" ratio is dynamic, is the likely explanation. 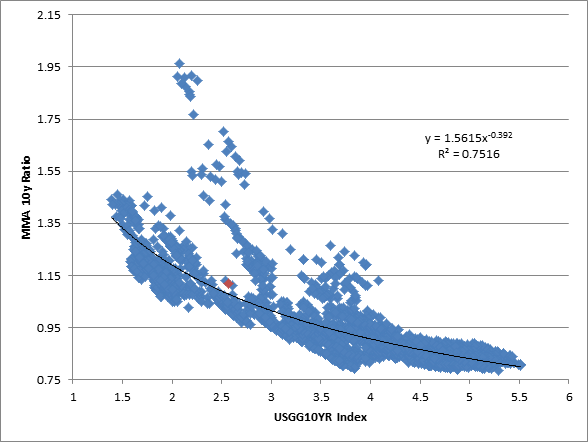 Although we do not put much weight on the automatically generated regression, we believe it to suffice as evidence that tax-exempt bonds tend to exhibit negative convexity, possibly from an absolute rate floor. 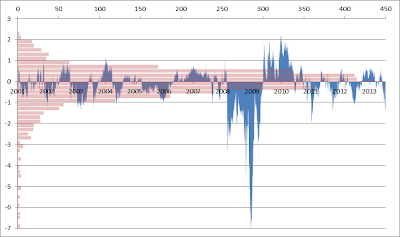 Below you can observe 2001-present and June 2009-present time series with accompanying overlaid histograms showing ratio changes over time and the distribution of values within those time periods. 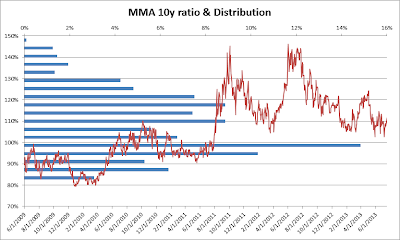 Please notice the increase in ratios as yields fell to new lows as the adoption of forward guidance and quantitative policy by the Fed lowered 10y rates to new post-WWII lows and the apparent reversion of this trend after the secular low was printed in June 2012. 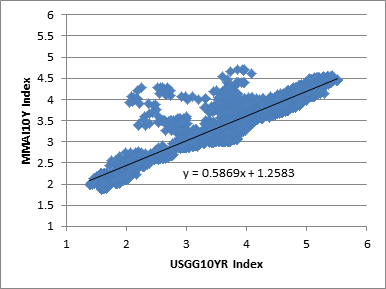 Continuing this general line of thinking, we explore a linear relationship between the AAA 10y tax-exempt yield and the 10y treasury yield and find strong evidence of a nearly constant sensitivity of municipal yields to treasury yields of 0.587. We expand this simple example into a multiple regression incorporating the MOVE index and the VIX index as a measure of treasury-implied volatility and a proxy for CDX.IG respectively. 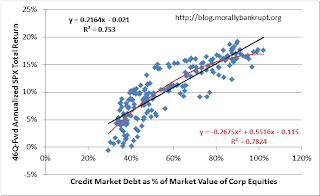 This allows us to internalize other credit-insensitive spread products into the model, namely MBS (for more information read about MBS replication) and high-grade corporate bonds. 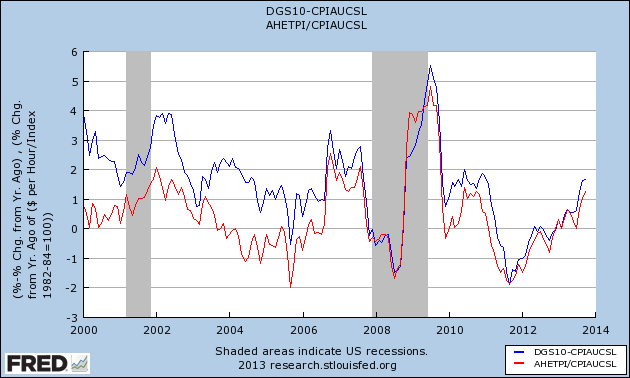 As you can see, outside the GFC-period, all of the variables are statistically significant, and the models exhibit high R^2s. Although there is mild colinearity between VIX and MOVE, the correlation is limited and the results are not invalidated. 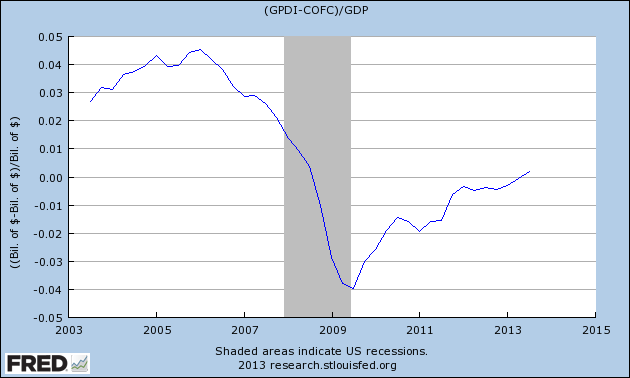 A test for heteroskadicity reveals no significant skerodasticity outside the November, 2008 credit meltdown. 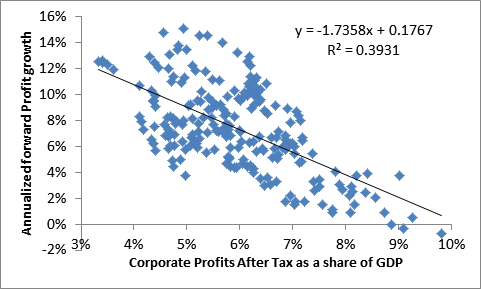 Based on the very high correlations as well as a review of the residual time series, we don't believe there was a significant structural change after the GFC and believe the benefits of using a strictly post-GFC distribution are outweighed by the lower sample size. For the following illustrations, we use the model regressed from the full sample. 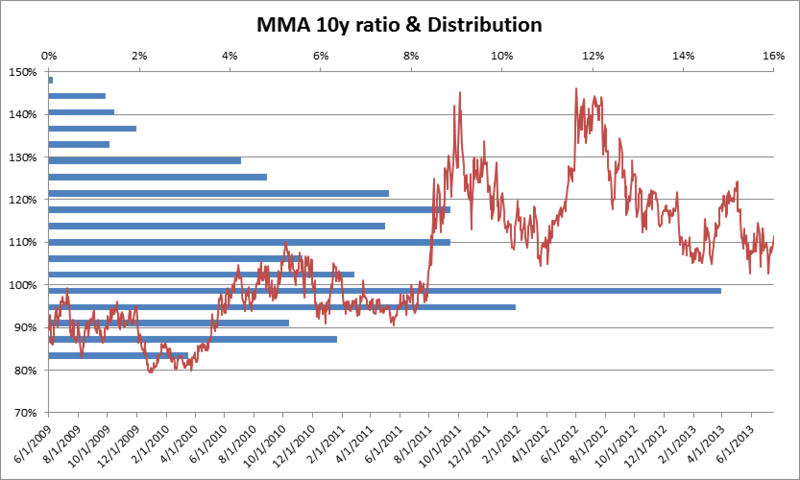 A higher residual value represents a lower than predicted yield for the MMA 10y benchmark and a lower value represents a "cheaper" MMA 10y. 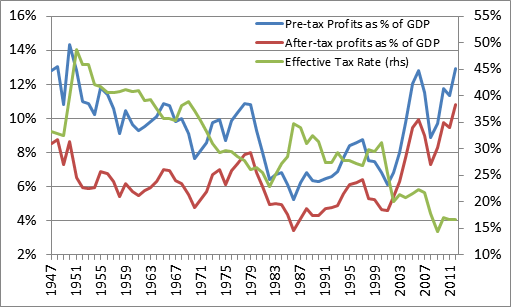 The first chart illustrates the last year, where the "basis" is the residual of the regression, in percentage points. 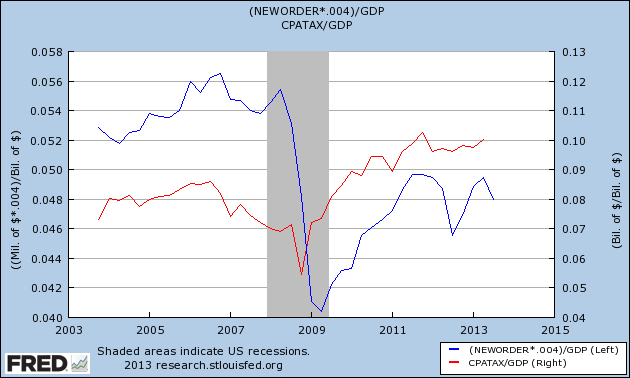 The second is a time series of residuals over the entire sample. We think high-grade tax-exempt bonds are cheap. 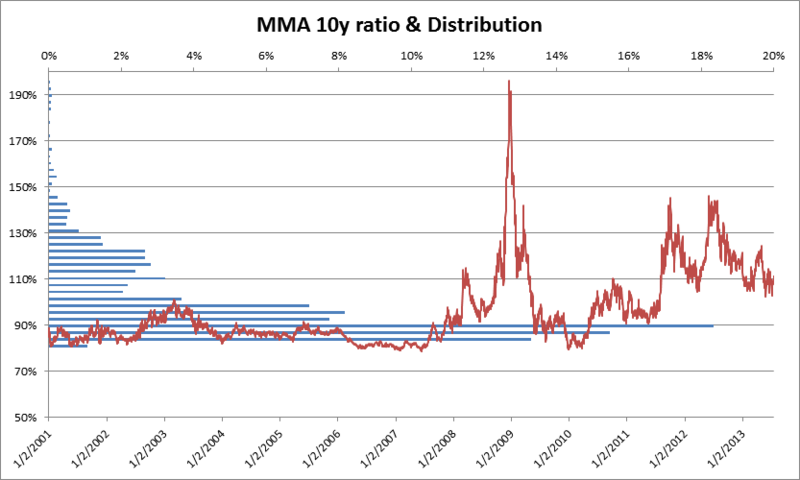 The yields we are seeing right now are usually associated with higher rate and/or higher volatility periods. 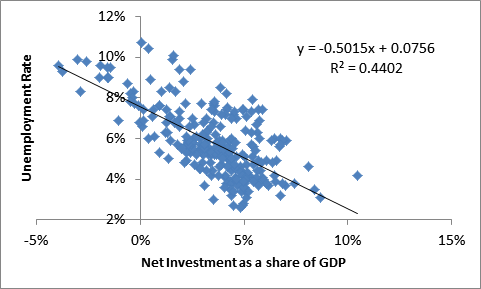 Additionally, given the apparent turn in interest rates, we see the lower rate-sensitivity and accompanying negative convexity as fundamentally attractive features in a rising-rate environment. The loss in "upside" from the negative-convexity is more than compensated, in our opinion, by higher pre- and post-tax yields, and there remains significant price-upside if yields normalize to predicted levels in a sideways-rates market. We believe ample liquidity and accomodative monetary policy limits the risks of a 2008-like tail scenario, despite what a certain blonde talking-head (who, incidentally, triggered the last sell-off of a similar magnitude in early 2011) with no P&L to speak-of may be saying on TV. 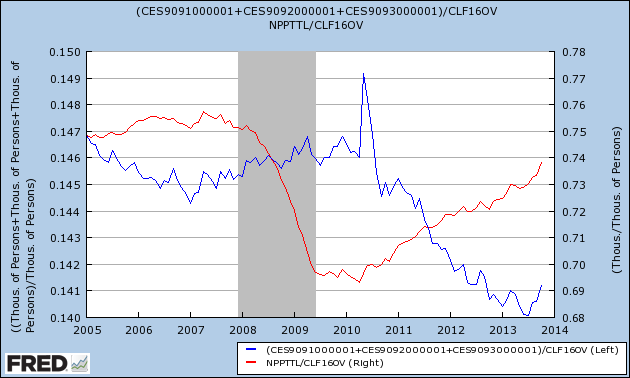 Depending on how much zerohedge you read, your mileage may vary. 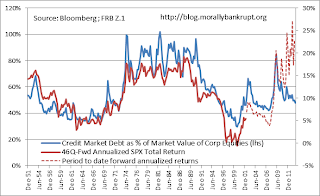 Tomorrow we will attempt to revisit the topic from a different angle, comparing tax-exempt credit to corporate credit to illustrate the difference in priced-in losses and then, sometime this weekend, we hope to touch on some vehicles the average investor can use to express a view on the sector.